This is the story and inspiration behind our news curation tool. We started working on ways to curate and share information back in 2001. Before browsers had tabs, we released a multi-tab browser called “optimal Desktop” that allowed users to curate and manage access to hundreds of web destinations with ease. The curated information was on the users computer, so the thought from the beginning was, how do you share this information with others? Over the years, as I was tinkering with the best way to share information in context (KBucket), I curated many news events of interest. The first event was the 2008 elections. A first in American history, with the first woman candidate for a major party, running against the first African-American candidate. I felt that curating these stories would become a valuable asset for anyone looking to write the history of that time. Since then, I have curated many more events. The first was the green uprising in Iran and then continued with the Arab spring. The next projects were the recording of WikiLeaks documents and the Occupy Wall Street movement, and then the elections of 2012 and 2016. I was envisioning a platform that framed events curated by each Journalist on one page, and allowed users to search and find events in context. A curated search platform, powered by the crowd, similar to how Wikipedia works! My idea was imagined from an insight I received during a discussion with my mentor Roger Weir. Roger is an educator who lectured every Saturday in Los Angeles from 1980 to 2015 without a break. His lectures were part of an education series he used to call “Ecumene”, and is now called “Learning Civilization”. Ecumene is an ancient Greek term for the known world. Roger’s education is informed by years of study, teaching, and his personal library of 40,000 books by major planetary mystics, artists, and scientists. Today the library has over 90,000 books. The library was located in Roger’s house, where he lectured. Every room and hallway in the house was covered with book-shelves full of the most amazing and informative books ever printed! After a Saturday presentation, as I was looking at the books shelved in the hallway, I curiously asked Roger if he had read all these books. His answer was more interesting than I anticipated; he said, “Yes, and I can index them all”. In other words, having read all the books, he also knew where to find the exact information he needed to craft his presentation for the week. This is the idea behind KBucket. A platform that lets Journalists share their curated research, and make their entire research indexable and discoverable, both for their own journalistic research, as well as for the benefit of their audience. Curation is a well-established tradition for Journalists. Indeed, all Journalists research their subject and curate information that will inform their stories. In the age of the Internet, much of the research is done and shared online and from multiple sources. This entails receiving reports from Journalists in the field, monitoring news sources, and purposeful web search. Monitoring of sources can be divided into what is reported by the “Main Stream Media” (MSM), as well as investigating credible news sources offering a different perspective. In other words real investigative Journalism must cover material outside the “Filter Bubble”. The “Filter Bubble” is usually what is filtered to you because of your interest. Discovery engines and other signals that are served well through algorithms should still be part of your arsenal, but only as an indicator of popularity. It’s the combination of algorithms and editorial decision-making that brings out the best results. The idea that when search and social networks only serve us content that we “like,” we’re not seeing content we need. He cited examples where liberal-leaning Facebook friends only see fellow liberals in their “Top Stories,” or a frequent traveler only got tourism results when Googling “Egypt” in the midst of the Arab Spring. By weaving content from different sources, journalists can use curation to burst the “Filter Bubble” and offer a fresh and insightful perspective on the stories they write. It is apparent that you can not rely on the filter to burst the filter bubble. Discovery sites work based on algorithms, and therefore cannot be your only source of information. Furthermore, looking at the source of information offers the essence or context of the source and not just the story. In other words, the placement of the article, the headline, the image used, are all part of the information you need to offer a fresh perspective. As an example, one thing I have observed is, all elite sites in the MSM, which include NYTimes, Washington Post, BBC, The Guardian, and even AlJazeera serve identical news with only slight variations. So just visiting these sites will not give you the whole picture on news! Other vertical and respected sources like Vox, Huffington Post, Talking Points Memo, Think Progress, The Intercept and +972 Magazine provide investigative reporting, and often offer insights not covered by the MSM sources. Some major European news sources like Deutsche Welle, France 24 and Euronews focus on news from a European perspective, offering news and views that matter the the European audience. In addition to these news sources it is important to visit more partisan news coming from blogs like Daily Kos, Drudge Report, Crooks and Liars, American Spectator and Breitbart that offer a more partisan view of politics (disclaimer: to various degrees). Furthermore, far East Asia news sources like Asia Times, Times of India, China Daily, Japan Times and Korea times will inform you of news and opinions from that part of the world. It’s easy to see that following and researching news requires that the journalist and researcher keep track of tens of news sources. It goes without saying that your job as a journalist and researcher will be made much easier if you could have instant access to all these sources in an organized manner, that would allow you to do your job effectively..
Obviously managing access to so many different websites is a challenge for anyone. Our KBrowser solution has solved this problem for Journalists. KBrowser is built to help you integrate, manage and optimize access to all your information sources and discovery tools in one place. 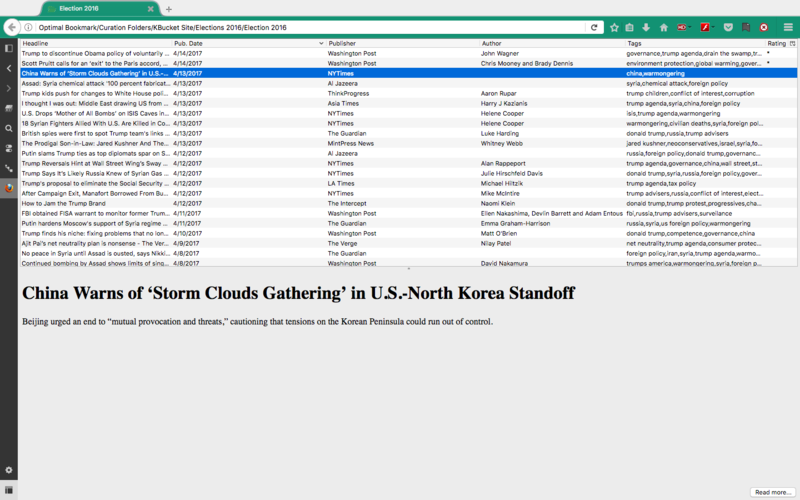 Lets take a quick look at how I have organized KBrowser to surf news sites. Over the months and years, you will curate hundreds and even thousands of articles. By carefully commenting and tagging your articles, the history of events will become instantly accessible. With KBucket, you can easily filter events and use it to to find the right connections in your story! Searching for news that is a few months or a few years old is almost impossible, unless you know the exact headline. But getting yourself into the habit of curating and archiving articles of interest in realtime, you will gain an incredible advantage in indexing and accessing those articles, even if the original link is removed! KBrowser provides the facility to curate, organize, comment and tag every article of interest with very little effort. This facility will allow you to build a digital library of hundreds of articles. These articles can now be easily indexed and filtered through your topic, date, author and publisher tags, saving you a tremendous amount of time in locating and finding the information you need to tell your stories. In order to make your curated research invaluable you need to pay close attention to proper indexing of your content. To fully understand what an index is, it is necessary to be both micro and macro-minded. On the micro level we concern ourselves with the specific mechanics of creating and index. On the macro level we put an index in the larger context of an information retrieval system. In other words, when you index an article, use tags that both identify the content of the article (micro tag) and how that article relates to other articles in your curated library and your big-picture narrative (macro tags). The successful management of information resources requires effort across the entire life cycle to ensure that contents are identified, organized, managed, preserved, and made accessible in a way that today’s users expect. KBrowser is designed to accommodate this process. We have created tools that make it real easy for you to access, re-organize and re-categorize a large number of links. Links are stored inside of curation folders, in a list/preview format, similar to your outlook email window. You can create an unlimited number of folders for organizing your research in multiple channels. KBrowser makes it very easy to find and access links, move one or more links between folders, with simple drag/ drop, and continuously optimize access to your research. 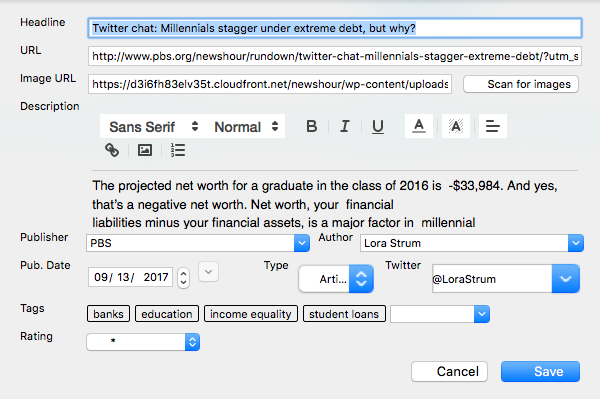 When you drag a link into a folder, the program automatically scrapes the information from the article and let’s you enter and modify the following fields. It is important that you personalize the description of the content, add your insights in real-time so you can capture your thought process and reasons for choosing that article for effective recall of that information. Furthermore, use tags that both index the content, and the context, for how this article relates to other articles and ideas in your library. This may all sound technical and burdensome, its not, its practical. As you start working with your curated library, all these concepts will come to you naturally. It helps when you think about them before hand, because it will save you time in the long run. Whether you are a blogger journalist, or work as part of a research team in a larger organization, you can package and share your KBucket research online in a format that is usable for any audience. The Kbucket curation platform, addresses every one of these problems in an elegant and efficient way. Let’s look at each item and examine how KBucket can help. Unskilled search can be divided into the following categories. A platform that let’s the skilled workers curate and organize access to information will greatly improve the findability of information. Furthermore a system that let’s “The Group” collaborate on the shared curated content will solve the problem of “poorly curated and hard to find information” in a group setting. A 3 year study of our solution at FirstAssist (Its now operates under Health Assured”) made the following findings. All these findings are relevant to a Journalistic organization that relies on research to perform their tasks. Furthermore, curated content becomes an organizational asset that can be used over time, and on new stories. Most Journalist share their own content on their social channels, but sharing other people’s content drives traffic to someone else’s site and not yours. If your aim is to boost your own profile, and inject your comments and insights to the articles you share, you will need KBucket. Today sharing on social platform happens on two ways. Journalist either share their own content, that drives traffic to their site, or they share other peoples content, which shares content to the destination site. A KBucket page, let’s you share other people’s content, while driving traffic to your own research first. Its a win-win as you are still promoting and driving people to other content, but only after they visit your site first. Here is how articles are shared on KBucket. 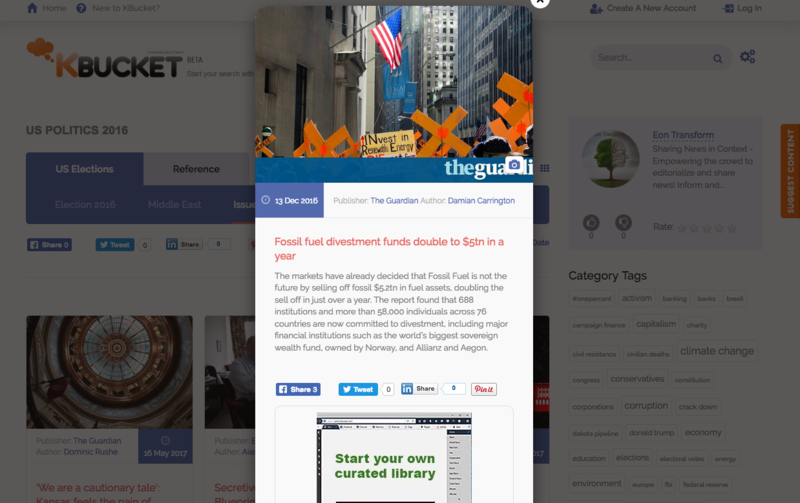 Each curated article opens in a lightbox (popup) window. When shared from here, the link will drive users back to this window, while promoting the article with headline, image and description you define. By sharing content that drives traffic back to your curated research, your postings are not aimless, but aim to educate and promote your brand! With the amount of content produced growing exponentially, it is impossible for any mortal to keep track and retain all that information. Furthermore, most people only pay attention to news sporadically. Editorializing news and making news accessible in context, outside of the “filter bubble” offers a tremendous service. Adam Rowe, in his article titled “I want to see startups curate local news“, describes our vision for KBucket, a platform that empowers the crowd to curate news. By allowing everyone the opportunity to curate and share news the way they see it, and providing anyone the ability to search multiple filters, we plan to burst the “Filter Bubble”, and allow visitors to easily and effortlessly examine multiple points of view. We’re not even a month out from Facebook‘s biggest PR disaster in recent memory, but it’s already kinda old news. One ex-curator at Facebook argued that the “Trending News” editors were biased against conservative news, but all everyone cared about was the revelation that Facebook even had editors. Lesson learned: no one wants a massive social media platform telling them what to read. Which is why taste-making curation startups should become a thing. My first job was in a news agency, and my mentor would chide me for entering the office without reading every other newspaper out there. It wasn’t because she wanted me to keep tabs on competition and the stories that were already out (there was that), but because she believed that that was where a whole lot of ideas were. Most of the quotes and references in this post are articles I have curated over time and share on our KBucket page. KBrowser is free. Simply start your Firefox browser (You can download a copy here, if you don’t have one) and click the link below to get KBrowser.